Hall of Fame martial artist, geologist, author, public speaker, astronomer, prospector and artist, Grandmaster Hausel of Arizona, was inducted into Action Martial Arts Magazine’s Hall of Honors 2012. Soke Hausel, a martial arts instructor of more than 4 decades, taught karate, kobudo, jujutsu & self-defense at four universities prior to opening a martial arts center at the border of Mesa with Gilbert and Chandler in the Phoenix valley. Soke is an instructor of Shorin-Ryu Karate, a martial art originally developed on Okinawa that teaches its members to respect oneself, each other, and works to develop powerful techniques. For centuries, it was the martial art of body guards for Okinawan royalty and peasants and was strictly guarded in secrecy, such that even the Japanese conquerors of Okinawa had no idea it existed until it was introduced to Japan in the early 1900s by Shorin-Ryu great, Gichin Funakoshi (1868-1957). Remember Mr. Miyagi and Daniel-san in the Karate Kid? Same karate! Master Alan Goldberg, publisher of Action Martial Arts Magazine stated, “Congratulations, we take great pride and pleasure to inform you of your Induction as an Ambassador to the Martial Arts, into the Largest and one of the most Prestigious Martial Arts Halls of Honor in the World”. Action Martial Arts Magazine touts their Hall of Honor to be the world’s largest gathering of martial arts superstars, film and combat celebrities and renowned masters in the world. The event has become known as the Academy of Awards of Martial Arts that is held at the Tropicana in Atlantic City, New Jersey. Soke Hausel was recognized for Outstanding Contributions to Martial Arts as a Grandmaster. In karate, there is only one living Grandmaster in any particular martial arts style or system. Hausel is the grandmaster of Seiyo No Shorin-Ryu Karate Kobudo Kai, Seiyo No Shorin-Ryu Karate Renmei and Seiyo No Shorin-Ryu Budo Bugei Renmei. Hausel began training in martial arts in mid-1960s and 40 years later (in 2004), he was awarded the highest rank in Okinawan Karate: 10th degree black belt. Prior to this event, he reached his greatest achievement in martial arts when he was certified Soke Shodai (grandmaster) in 1999 and certified by two of the world’s greatest martial arts grandmasters. At the turn of the century, he was inducted into the Millennium Hall of Fame as a polymath due to contributions to geological sciences, public speaking, writing and martial arts (he has also been active in art, astronomy and music). He is an author of nearly 1000 publications and 100 books and responsible for discovery of hundreds of gold and gemstone deposits. In 2001, he was inducted into the National Rock Hound and Lapidary Hall of Fame. Since 1998, he has been inducted into 16 Halls of Fame around the world for martial arts and geology and has been awarded Instructor of the Year in 1998 and 2004, the International Instructor of the Year in 2001, and Grandmaster of the Year in 2000, 2002, 2003 and 2005 by various national and international martial arts associations. 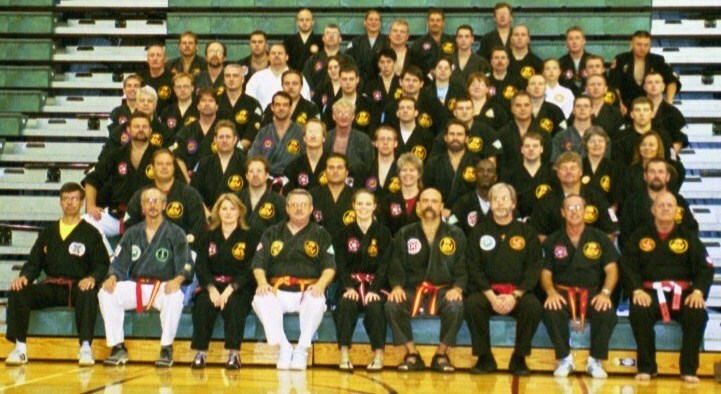 Professor Hausel of Mesa, Arizona was inducted into Action Martial Arts Hall of Honors at the Tropicana Resort in New Jersey for Outstanding Contributions to Martial Arts as a Grandmaster. Hausel taught martial arts at 4 universities before teaching at the Arizona School of Traditional Karate at 60 W. Baseline in Mesa.